Continuing our last blog where we considered how it all began let us now explore what can be done about it…. No one is above anyone else! You have cultures and religions that say males are superior to females and seek to oppress them accordingly. You have cultures and religions that say one race is superior to another race and seek to oppress them accordingly. You have cultures and religions that say one religion is superior to another religion and seek to oppress them accordingly. You have cultures and religions that say one country is superior to another country and seek to oppress them accordingly. It is possible to have a mutually submissive society. Sure there will be those who are better at some things than someone else and that person’s gifts should be submitted to without having to come under their authority or be oppressed by them in order to benefit from their gift. If we would just look at everything we have as, just that, a gift, then we would not claim it as our own and allow others to benefit from the gift given to us whether it is an invention, a skill, a philosophy or whatever it may be. Any time we take something as our own and not acknowledge it as a gift we elevate ourselves with a much higher importance than we should and we have to constantly prop up this illusion by ego, oppression, superiority or whatever tactics we have to use to gain advantage over another and make them subservient to us if they want to benefit from the gift they have convinced themselves is of them. I know some that are reading this think this is not possible, that someone has to be in charge. In many Native American cultures it was just like I am talking about. When the European explorer came to this country they were often bewildered when a Native American was asked ‘Take me to your leader’ and they did not understand what they meant for they had no specific leader or chief. 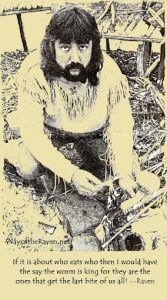 There were entire tribes of people in North America that had no so-called ‘chief’. These tribes had a council that included all the people and where all the people could speak, including women and even children! Yes, even children were allowed to speak and the decisions that were finalized were decisions all agreed on and very often decisions were not made until it was considered how it would affect up to seven generations. The animal kingdom nor any other organism has a system of kings or lords over others except human beings. And very often as time progresses the ruling class are not even worthy or beneficial or have anything to offer those ‘under’ them. The majority is ruled by a minority that has the means to force the majority to submit to their rule to serve them rather than the leader serving those ‘under’ him. This is often determined by who has the superior technology or resources that they can control and lord over that group they wish to oppress. Take the example of the cheetah. It runs down a wildebeest and kills it and eats it. Immediately following the kill the rest of the wildebeests do not continue to run and hide they will settle down in close proximity of where one of their own was killed and begin to graze again. They recognize, rather don’t even consider, that the cheetah was cruel and was superior to them or proclaiming itself king over the wildebeest. They recognize he caught the slowest and most genetically inferior one among them which keeps their herd healthy and only strong DNA is assured. They also recognize that the cheetah only takes what it needs and provides for himself and his offspring and the scavengers that eat what is left. Eventually all die and become food for the worms who make dirt that is needed to grow plants that is needed for grazers like the wildebeest to eat…a beautiful circle of life. If it is about who eats who then I would have the say the worm is king for they are the ones that get the last bite of us all! Developing your character takes work. It takes patience, dedication and perseverance. It is not an easy thing to do, at least not at first. There will constantly be temptations to step away from your principles. This is why the perfection of your character is a never-ending process. The opportunities to slide backwards are also never-ending; therefore the opportunities for new victories over yourself are endless. Each day you have to work at maintaining your character. 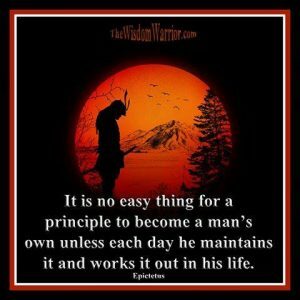 You have to work at developing your principles. 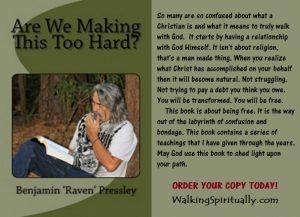 It will become easier and easier as your principles become second nature to you, but you will still have temptations to compromise those principles, even once you have made them your own. 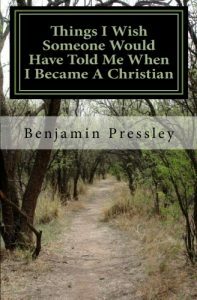 Developing your character and living by a set of principles is not a goal, but an ongoing process. It takes work and discipline to resist the many temptations to compromise your standards. You can liken this to the wise fish who never takes the bait. This fish has learned the strategies of the fishermen. He recognizes all the various baits and lures that he has been tempted with over the years. 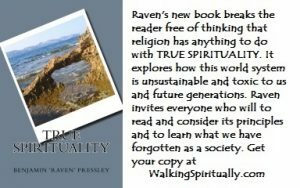 Here are some great books to help you on your spiritual journey! 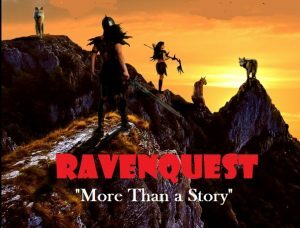 RAVENQUEST truly is more than a story! 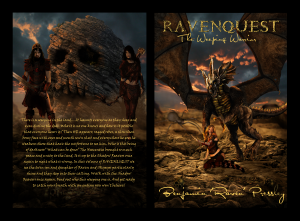 RAVENQUEST is my fantasy fiction story that is full of exciting adventure. It is family friendly and original. 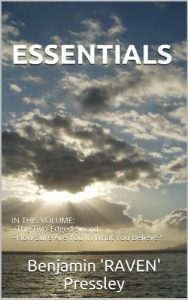 You will love the spiritual philosophy shared, the challenge to community and most of all the exciting and entertaining story that looms through its six volumes with volume 7 coming out in December.